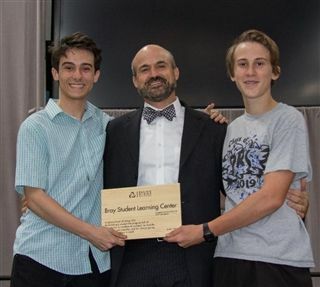 During the Upper School Award Ceremony, Pacific Ridge's departing Head of School Life and Facilities, Peyton Bray, was honored through the naming of the school's learning center - henceforth known as the Bray Student Learning Center. In an emotional speech, Dr. Ogle praised Mr. Bray for a "capacity to give to those in need that is truly unparalleled." For the past eight years, Mr. Bray has worn many hats at Pacific Ridge. He has directed student activities, student discipline and student support; taught journalism, math, and woodworking; and managed everything from the school calendar to facilities. Thank you, Mr. Bray, for your work, energy, compassion and friendship. You have left an indelible mark on Pacific Ridge, and you will be missed.